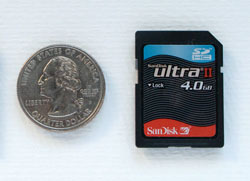 How do you pick the right SDHC card for you? Should it be 30X, Class 6? What do those terms even mean? In this podcast I explain the three most important criteria for choosing the right memory card: capacity, read/write speed, and class. The bottom line is, many photographers don't have to spend the big bucks for super fast cards, unless they have cameras that can take advantage of that speed. I've also written an article for Macworld Magazine titled, Buy the right SD card for your camera that spells out everything I discuss in this podcast. If you're interested in this subject, you might want to read it. You can also download the podcast here (17 minutes). Or better yet, subscribe to the podcast in iTunes. Embrace is the Dec. 2009 Photo Assignment. You can read more about how to submit on our Member Participation page. Deadline for entry is Dec. 31, 2009. Secret Lynda 'technique' video for release early next year? I hope that A***e doesn't screw this one up, or they'll lose most of their A******e base real quick. I appreciate and respect your point of view. It was a nice post you told us, dont stop updating your site, that's nice. I did a search about the article and noticed some people would agree with your post. I have bookmarked this web site so I can visit next week and read more posts. It's funny that you finally spoke up! I have been waiting for someone to bring this out to the open! Anyway... nice post. I will be back.